These Democratic buttons and pins are a great way to show your support for the Democratic Party. Also, you can now choose either a safety-pin back or magnet back on all buttons! When tax loopholes need to be trapped, who do you call? Democrats! Show what side you are on with this button. This celluloid button measures 2" x 3" with a safety pin back. The magnetic back lets you proudly display this button on any magnetic surface. Union made in the USA. Get your very own Jesse Jackson button today! This celluloid button measures 3" with a safety pin back. The magnetic back features the safety pin back along with a magnet so you can wear the button or stick it to a refrigerator. Union made in the USA. Show your support for President Obama! This celluloid button measures 3" with a safety pin back. The magnetic back features the safety pin back along with a magnet so you can wear the button or stick it to a refrigerator. Union made in the USA. The Republicans have started a war on the poor. Fight back and show what side you are on with this button. This celluloid button measures 2" x 3" with a safety pin back. The magnetic back lets you proudly display this button on any magnetic surface. Union made in the USA. Elizabeth Warren is a champion of the working and middle class. 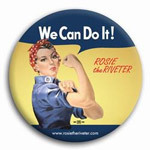 The sentiments from her book A Fighting Chance inspired this union made 2" square button. This celluloid button measures 2" x 2" with a safety pin back. The magnetic back lets you proudly display this button on any magnetic surface. Union made in the USA. 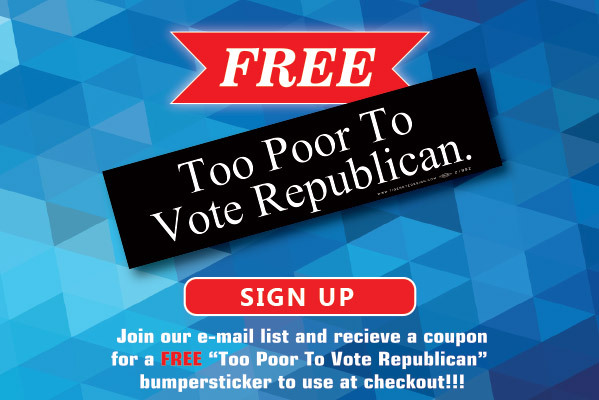 Show how you annoy republicans with this personalized anti-republican button. This celluloid button measures 2" x 3" with a safety pin back. The magnetic back lets you proudly display this button on any magnetic surface. Union made in the USA.For bulk quantities, personalized text must be the same. Show that you are proud to be a Democrat and what you support with this personalized button. This Democratic button measures 3" with a safety pin back. The magnetic back features the safety pin back along with a magnet so you can wear the button or stick it to a refrigerator. Union made in the USA.For bulk quantities, personalized text must be the same. No working American should live in poverty! Show your support for a minimum wage increase with this 3" union-made button. This celluloid button measures 3" with a safety pin back. The magnetic back features the safety pin back along with a magnet so you can wear the button or stick it to a refrigerator. Elizabeth Warren embodies whatit means to be a pragmatic and compassionate leader. Show your support for her to run for president with this Run Liz Run button. This celluloid button measures 2" x 3" with a safety pin back. The magnetic back lets you proudly display this button on any magnetic surface. Union made in the USA. For all our Latina friends out there trying to get immigration reform passed. Don't give up! You can and you will make this happen! This celluloid button measures 2.25" with a safety pin back. The magnetic back lets you proudly display this button on any magnetic surface. Union made in the USA. Are you 100% Democrat? 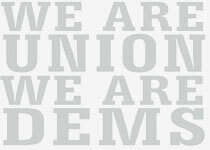 Show your Democratic pride with this union made 3" button. This celluloid button measures 3" with a safety pin back. The magnetic back features the safety pin back along with a magnet so you can wear the button or stick it to a refrigerator. This button highlights the estimated 11 million undocumented immigrants currently in the United States. Let's end this cruel policy of breaking up families by fixing our broken immigration system! This celluloid button measures 2.25" with a safety pin back. The magnetic back features the safety pin back along with a magnet so you can wear the button or stick it to a refrigerator. Union made in the USA. Get this throw back button! This celluloid button measures 2.25" with a safety pin back. The magnetic back features the safety pin back along with a magnet so you can wear the button or stick it to a refrigerator. Union made in the USA. Show your support for President Obama and the rest of the presidents with this Democratic button. This celluloid button measures 3" with a safety pin back. The magnetic back features the safety pin back along with a magnet so you can wear the button or stick it to a refrigerator. Union made in the USA. Former President Obama was much better than our current President Trump. Show everyone that you are ready to make a change! This celluloid button measures 3" with a safety pin back. The magnetic back features the safety pin back along with a magnet so you can wear the button or stick it to a refrigerator. Union made in the USA. Call for bulk pricing! Get this throw back button! This celluloid button measures 3" with a safety pin back. The magnetic back features the safety pin back along with a magnet so you can wear the button or stick it to a refrigerator. Union made in the USA.